It took me a few tries, but once you get going, this cord is amazing. It looks just like i-cord, and is much faster to make. I used Lamb’s Pride worsted, always my go-to yarn for trying something new. 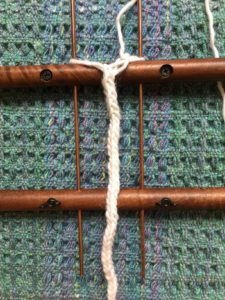 My hairspin lace loom works great. I know this is the first step to making cord, and it can’t all be this easy, but I love it so far! Can’t wait for tomorrow’s lesson. This sample took me less than 5 minutes to make. 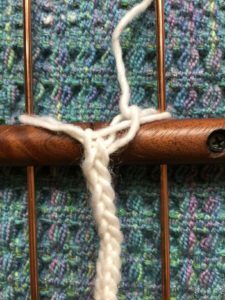 Definitely my new favorite way to make i-cord! Check out www.stitchdiva.com to join the challenge.